At the National Low Income Housing Coalition, it’s our job to understand the intricacies of the federal policy environment. We meet with Members of Congress and their staff on a regular basis, and work collaboratively with other national housing and social policy organizations to create and execute strategies that will affect positive policy change. We also work hard to make sure our members and supporters are as educated about, and engaged in, the policy and budget processes as we are. Our founder, Cushing Dolbeare, believed strongly that there are plenty of Americans who want to support housing policy that meets the needs of the lowest income people; they just need to know when to take action. This believe still guides our work, and today, we make available a variety of resources, from newsletters like Memo to Members and Tenant Talk to data and tools like Out of Reach and the Congressional District Profiles, that give you the information you need to be an effective advocate. If you are signed up to receive the Coalition’s email alerts, you know that on June 12, we launched a new email called Action Digest. This biweekly email pulls together information from a variety of sources, including Calls to Action and Memo articles, to help our supporters keep track of policy progress and weigh in when advocacy is needed. 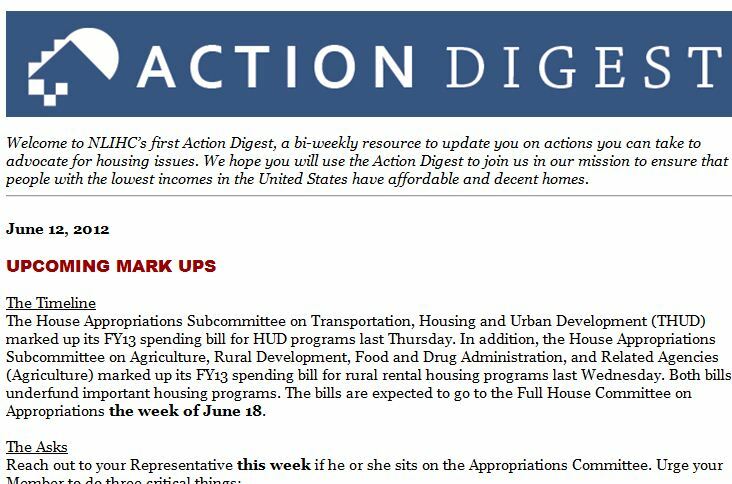 Action Digest helps supporters see the whole picture of housing advocacy, from upcoming mark ups to pending bills to opportunities to thank lawmakers for advancing good low income housing policy. The first edition of the Digest received lots of praise from our members. We hope you’ll sign up to receive the Action Digest and our other emails, and let us know what you think of this new resource.